Located behind Barrett Hall above Route 132 in South Strafford, Harrington Hill ski area has provided locals with a place to ski for decades. Present day Harrington Hill ski area likely dates back to at least 1969, when the Strafford Athletic Association (established in 1965) relocated the original Strafford Rope Tow to land owned by Harrington family. 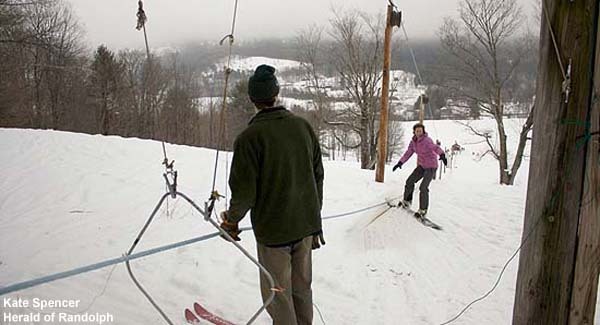 The Harrington Hill ski area remained in operation until around 1985, when liability insurance costs became too high for the Strafford Athletic Association to cover. After sitting idle for a season, the ski area was resurrected by the Strafford Lion's Club, who continue to provide funding to this day. Lion Rod Maclay and his wife Cindy now own the former Harrington property and continue to allow the rope tow to operate there. The area is open to town residents and their guests. "I had the pleasure of skiing this rope tow on Feb 21st 2015. According to the supervisor the tow got a new rope this past fall. Free to use, while it is mostly used for town residents anyone is welcome to use it. I would move this into the small ski area section. Hours are sat/sun 1-4 some holidays. "